The first, utterly adorable book in a new chapter-book series. Addie Gibson, a white girl in Bishop’s illustrations, is bored and lonely in her new home. During an exploration of the forest behind her house, Addie meets a colorful butterfly named Sky Dance; however, Sky Dance isn’t an everyday, nonmagical butterfly—she’s a Wishing Wing, and the entrance to her home, Wishing Wing Grove, is on the other side of the woods. 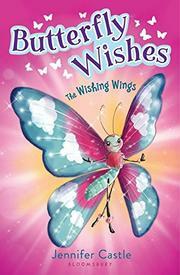 Sky Dance and the Wishing Wings need Addie’s help. Someone has placed a dark enchantment on New Blooms—Wishing Wings who have just emerged from their chrysalides. The effects of the enchantment are unclear, except that it seems to cause New Blooms to forget both who they are and their mission: to spread the lightness of mind that is intrinsic to the butterfly spirit. New Blooms must grant a wish by sunset on their first day out of the chrysalis, or they lose their magic forever. Sky Dance’s newly emerged sister, Shimmer Leaf, is one of the cursed and suffers from this mysterious butterfly amnesia. The solution is easy: Addie’s little sister, Clara, could use some cheering up; perhaps human girl and butterfly can help each other help their sisters. The story concludes with the promise of more adventure. Life lessons hover dangerously between subtle and pedantic, but they lean slightly closer toward less is more.